The truth is this - I’ve always ignored recipes that required dried chile peppers. The dusty, shriveled chiles in the supermarket appeared old and tough. Apparently, water would revive them but I never tried. 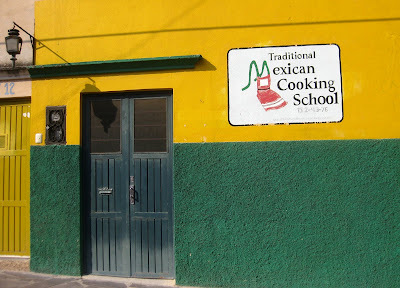 Enter Marilau Ricaud, mistress of Mexican Ancestry Cooking School in San Miguel de Allende, Mexico, who promised to take the fear out of dried and fresh chiles . We signed on to learn the basics of Mexican salsas. Please note that this translates into sauces and not the chunky salsas we use for toppings or dips. Marilau is proud of the contributions that Mexican ingredients have made to the world’s cuisine. Until the Spanish explorers returned from Mexico to Europe, there was no tomato sauce in Italy, no Swiss chocolates, and no green bell peppers (which are really poblano peppers grown in European soil). But it is the native chile peppers that have most influenced the world through traditional Mexican cooking. Fortunately, the mysteries of dried and fresh peppers resolved as the lesson progressed. 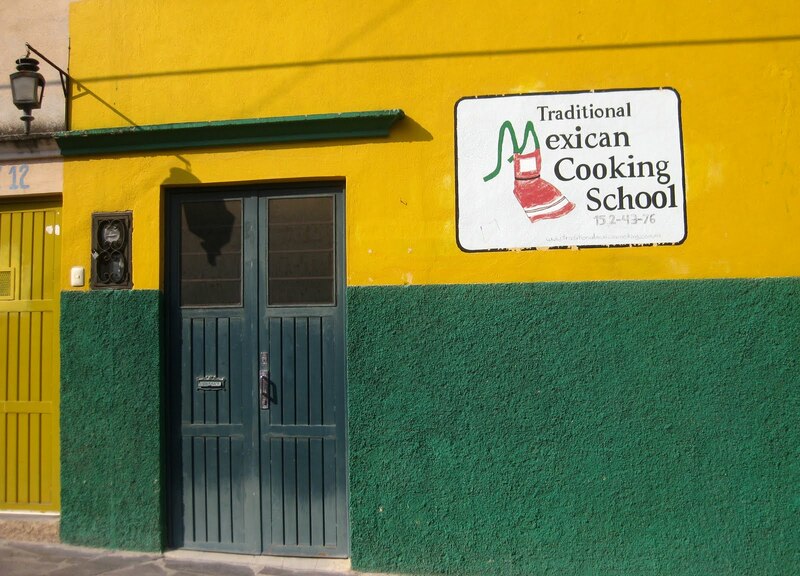 Marilau shared some basic Mexican recipes which were cooked according to prehispanic techniques. She also included two that had been handed down in her family. One of her grandfathers was French and a baker and the other hunted and cooked wild game. Marilau had been immersed in food since infancy. At the beginning of the morning, we took notes of the rules of chile pepper salsas before starting to cook. Never make a salsa with two different kinds of fresh peppers. You can mix dried chiles in a salsa. Most recipes were amazingly simple with all having only 6 to 10 ingredients. The dried chiles’ oils had to be developed by toasting on a comal or flat griddle on top of the stove until the chile’s odor was released - less than two minutes. It is then soaked in warm water or other liquid before mixing with the remainder of the ingredients. After years of unnecessary angst, dried chile peppers’ mysteries were revealed. A blender was essential as all ingredients were tossed together at some point of the process. Having only cooked Tex-Mex, I was surprised at the variety of flavors used. - whole cloves, cinnamon stick, marjoram, and thyme. Liquids included chicken broth, orange juice, and cider vinegar. Mexican sour cream had to be used as the American kind would curdle. (BTW, Mexican sour cream is available at our Wal-Mart.) And Mexican manchego also differed from ours with Gouda a viable substitute. Marilau continued to educate us as the lesson progressed. Mexicans don’t flavor with fat. The main purpose of a chile is to spice the dish and weather and soil can affect the heat You can always add heat but never cut it. Since much of the heat of a chile pepper is in the seeds, it’s best to remove those before cooking. The discussion reminded me of the challenge our local Campbell Soup has in making a consistent Pace Picante Sauce or Salsa. They have to buy “heatless” jalapenos in order to tone down the spice. At the end of the morning session, there were a few more instructions. Dried chiles can’t be overcooked. Never serve with wine - The Spanish forbade the production of grapes and olive trees because they wanted to protect their monopoly for the home country. 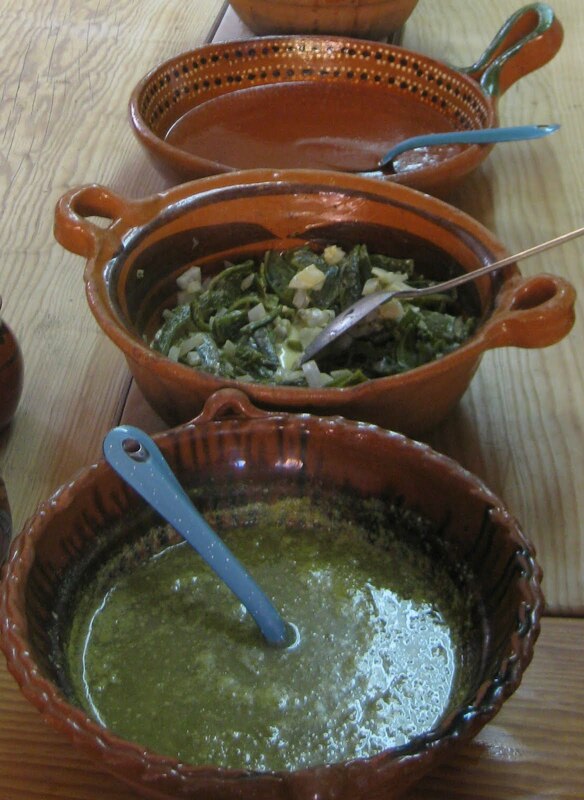 Consequently, traditional Mexican recipes and meals don’t use these ingredients. Her suggestion - serve with beer. We got to sample the six distinctive salsas made that morning with more directions on when to use each. 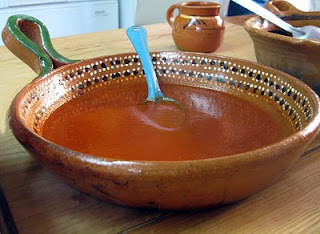 The Salsa de Chile Ancho was the most versatile as it’s the familiar red sauce topping for enchiladas, chilequiles, meat, rice or even fried eggs. But the Salsa Morena reigned for pork, duck, chicken, turkey or brisquet. Fortunately, I’ve been able to find most of the required peppers in Paris although the dried, smoky chipotle peppers were purchased at Central Market in Austin. I’m grateful to Marilau for opening up a whole new world of ingredients. She has permitted me to post one of her easiest fresh pepper recipes on my web-site - www.thetravelinggene.com - which I hope you’ll try. For the dried pepper dishes, you’ll need to be brave or take her lessons. Put all ingredients in blender except the oil. Blend until pureed. Heat the oil and add the pureed ingredients. Cook salsa for 15 minutes. This sauce is good for everything in Mexico! It can also be used for a soup by adding vegetables and/or chicken and more broth.